UTM Kuala Lumpur (UTM KL) is a graduate campus of Universiti Teknologi Malaysia (UTM), and is under the same corporate structure as its main campus in Johor Bahru, Johor. 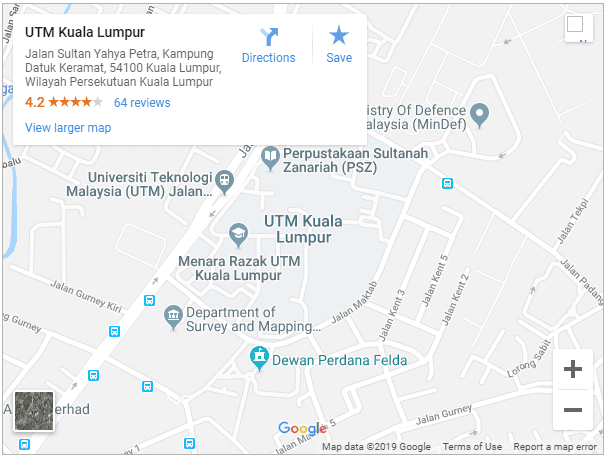 The current UTM KL which is located at the center of Kuala Lumpur city used to be the original campus of UTM on Lot 4582 Jalan Semarak, with an area of 47.56 acre. UTM KL is a semi-autonomous branch campus headed by a Campus Director and the whole structure is governed by the same Board of Directors under the same protocol of Chancellor and Pro-Chancellors. The administrative and academic support for UTM KL is provided by the major administrative offices such as Office of the Registrar, Bursary, Library, Office of Asset and Construction Management, Centre for Information & Communication Technology and Office of Corporate Affairs. UTM KL is in its own local community affiliated with UTM, offers leading-edge programmes at bachelor and graduate degree levels and provides services both locally and internationally. In the current academic session, the UTM KL is offering full-time undergraduate programmes and postgraduate programmes under its three major schools: Razak Faculty of Technology and Information, Azman Hashim International Business School and Malaysia Japan Institute of Technology (MJIIT). Some of these schools also offer part-time executive programmes for working professionals. In addition, part-time and modular programmes are run by UTMSPACE (The School for Professional and Continuing Education). There are several centers of excellence in UTM KL which carry out research activities and also offer some academic programmes. Other major supporting units include the branch offices of Innovation & Commercialisation Center (ICC), School for Graduate Studies (SPS) and International Affairs. Their presence in the Kuala Lumpur Campus would be supportive of the Campus key results areas and its strategic objectives. The University of Meiji also operates an office in UTM KL under the UTM-Meiji collaboration programme and the Malaysia-Japan International Institute of Technology (MJIIT) also operates here.